We have a four-fight pay-per-view telecast with each matchup up holding a unique, significance in its own right. We have two world title fights on the pay-per-view. There’s also a 12 round featherweight bout that’s going to open up the show between Jhack Tepora and Hugo Ruiz. We have a main event that pits two of boxing’s biggest stars in Manny Pacquiao and Adrien Broner in a really important, 147-pound world title fight. But the co-feature here, this is an interim title fight between Badou Jack and Marcus Browne. These are two fighters that have come of age on SHOWTIME. Both began their careers, early in their careers were featured on ShoBox: The New Generation against very tough opponents and have fought on virtually every live boxing series that we have on the network. This is Marcus Browne’s eighth fight with SHOWTIME and this will be Badou’s 13th fight with us. So we’re proud to have them back. They have a special place for all of us on the crew and on the team here at SHOWTIME Sports and for all of our viewers who seen him develop their careers to this important moment. Both men have something to prove on January 19. The light heavyweight division is a division that is now wide open. There’s a lot of fresh talent and a lot of people vying for the top spot. Both men deserve this shot and this entire card is a really terrific way to kick off 2019. We’re excited. Just a brief program reminder regarding this event, ALL ACCESS: PACQUIAO VS. BRONER will premiere this Friday at 10:30 p.m. on SHOWTIME. It’s a three-part series covering the main event fighters as they prepare for the big fight. Episode two will premiere on Friday, January 11 at 9:30 p.m., and that’ll be followed by our first ShoBox telecast of the year. So with that, I’ll turn it back to you, Leonard, and we’ll get right to the fighters. Thanks for your time. Yes, thank you, Chris. Again, as Chris touched on, this – in my eyes, this is an outstanding bout. This is a bout that the fans have been talking about for a while. These two have been going back and forth a little bit on social media. What an outstanding co-feature to a great main event and overall outstanding card. Talking a little bit about Marcus Browne, he’s a very, very exciting young fighter, a former Olympian who’s going to be looking to make a statement against a former two-division world champion in Badou Jack. And I think that, come fight night on January 19, Marcus is looking to, not only make a statement but open himself up to fighting anyone else that’s out there, any top guys in the light heavyweight division. So, without further ado, I would like Marcus Browne, who comes to us with a 22 and 0 record with 16 big KOs from Staten Island, New York. Marcus, would you like to say a few words? Happy New Year everybody. I’m honored. I’m ready. I’m working hard. I’ve worked hard my whole career for this point and Badou Jack, a respectable guy, two-time world champion, but come January 19, we’re bringing the whole kitchen sink and anything else with it. I’m ready to take care of business. I know he knows what’s coming to him. And I really haven’t got too much to say. I’m going to let my hands do the talking. I’m not huge braggadocios kind of guy. Neither is he, from what it looks like. It was one of the easiest fights to be made in the division and I appreciate you for signing the contract and being a man and stepping up. Come January 19, you got hell coming. You’ve got fury. You’ve got everything coming to you. This ain’t no Anthony Dirrell. This ain’t no washed up George Groves that got beat up by Carl Froch twice. This ain’t no old Adonis Stevenson. This ain’t no Nathan Cleverly. This is Marcus Browne, my brother. So make sure you’re ready because I know I’m ready. Well, thank you, Marcus. And moving on to the former two division world champion. I can’t say enough great things about Badou Jack. He’s the guy that’s always willing to take on the best that’s out there. This is a fight that he asked for and it’s a fight that I think that Marcus Browne’s style will make for a very, very exciting fight. Badou is used to fighting any and every different style. It’s a fight that he’s really, really looking forward to. So without further ado, former two-division world champion, none other than Badou Jack. Hey, how is everybody doing? You know, I’m excited for this fight. I’m always in the gym, always working hard. So I don’t have to say that I’m ready. I’m always ready. It’s going to be good fight. The young hungry guys have got something to prove. I’ve been there, been battle tested because I fought the best. I don’t have to brag about what I’ve done. This is the best guy available and we’re going to have some fun. It might look easy from the outside. Well, it’s a little different when you step up to world-class in the competition. Trust me. I know it ain’t easy. And I’m working like I’ve never worked before in my life, so trust me, I know it ain’t easy. And you could say what you want from the outside. Come January 19, you’re going to see. You’re going to see. So, keep it up. I let my hands do the talking. Everybody knows me. do you feel you’re more prepared for this type of fight than Marcus is because of the level of opposition that you fought? To have experience against great fighters, of course, is going to play a major role in big fights but in boxing, anything can happen. I’m very confident. I’m ready and I’ve been waiting. I haven’t fought since May. I’m definitely ready. I’m really hungry, so experience is a major key, of course. Marcus obviously has a very fast hands. He’s a strong guy. What you think of him just overall as a fighter? The little that I’ve seen, he’s a good fighter. He’s definitely a good fighter. Marcus, what do you think of Badou Jack and maybe his level of experience against top guys? Well, most of his fights have been at 168. Nathan Cleverly was washed and Adonis Stevenson is old. He’s a very strong minded, hungry and a great champion, of course, but come January 19, he’s going to see that he hasn’t fight anybody like me, plain and simple. I’m not James DeGale. This is the light heavyweight division. He’s fighting a real light heavyweight and a young, strong, light heavyweight. So, we’ll see come January 19, like he said. Marcus, I’m not sure how closely you watched the fight but when he fought Adonis Stevenson back in May, who did you think won? I didn’t watch it to see who won. And, honestly, I really don’t care who won, it didn’t matter to me, but it was a good fight. He started off slow. Picked it up towards the end. Still couldn’t get him out of there. So, good fight. Thank you, Marcus. I have a question for both guys, as well. Obviously what happened to Adonis last month was a reminder of how brutal this business is. I was just wondering, Badou, having shared the ring with him, what your thoughts are and what happened to Adonis and maybe how he’s recovered so far. And, Marcus, I know you didn’t fight him, but if also you could speak to that as well. I was very emotional about it because I’ve been in that ring with him in my last fight. And he took a lot of punishment in that fight. He was stumbling around in the hotel after the fight. Everybody said he really took a beating. So, it’s sad. But this is what we signed up for. I’ve been praying for him since this thing happened. I’m glad he woke up and hopefully he can recover. It’s the business. It’s nothing personal. This is just business. We’re trying to feed our families. Hopefully you get back to normal so he can enjoy his family and his kids and everything. He just had a daughter before for the fight so, it’s sad but God willing, he’ll come back to normal. It’s a sad and unfortunate situation but this is what we sign up for, what we sign on the dotted line for, getting in the ring. That’s the risk that we take at fighting. I feel bad for him but hopefully he comes out of this with all of his faculties, so he could be able to enjoy his family like Badou said. Most importantly, he’s older. He’s an older fighter. Father time caught up with him. I heard he was going through a lot of things outside of the ring so maybe that was part of the reason. But hopefully he will be all right. Badou are you now at the point where you kind of feel that you have to enter each fight with the objective of taking the judges out of the result so that there are no doubts that you are the clear winner? Yes, you can’t really complain to the judges. In all those close fights I had, I landed more than 100 more punches than my opponents. And most of them – this is sad, but most of them were not the same fighter after. I just have to make a statement. They’re not going to do me any favors. This is for the interim WBA title and if you win, would you welcome a fight against the full world champion, Dmitry Bivol? Yes that’s the fight that I really wanted but, right now, I’m focusing on Marcus Browne. That’s where all my focus is, so I can’t look past anyone. I know that as a fighter better than anybody else. I’ll speak on that. If Badou is victorious in this fight against Marcus Browne, he’s willing to fight any of the light heavyweight champions out there – any of them. Would you say that the winner of this fight can make the claim that they are the best light heavyweight in the world? There are four champions better ahead of Marcus Browne. So just me beating him, that doesn’t really make me number one. I thought I would beat Stevenson and he was the lineal champion. But I don’t really focus on that. I’m focusing on winning my fight. All of the other stuff is just bonus. Badou do you feel that you will be able to get up the way you normally would for a fight being that Marcus isn’t one of the champions? Yes, that comes with experience. It’s the ability be ready whenever. It doesn’t matter if it’s the champion or if it’s a contender or whatever. You’ve got to think that every fight is a world title fight or the toughest fight of your life. So, my motivation is never a problem. Leonard I heard you say that after this fight, if Badou is victorious, he’s willing to fight all of the champions. Is he able to go out and seek those champions on their respective networks? We’re willing to listen and entertain any offers that are out there. Obviously, Badou has a very tough fight ahead of him in Marcus Browne and he’s got to get by Marcus Browne first before considering anything else. But to answer your direct question, we’re willing to listen to any offers that are out there, if he’s able to get past Marcus Browne. Marcus, how badly did you have your mind set on Badou? Was this your only option? Actually, well, couple months ago, all other guys were busy and he was the only guy who wasn’t, so it was one of the easiest fights to make. It really doesn’t matter to me who I fight. I’m tired of sitting around and not being active. I like to actually be in the ring. Is there anything that you see in Badou that’s giving you confidence that or is it frustration of not getting one of the champions? No, no frustration, and I don’t see anything. He’s a tough, tough fighter. He’s not an easy fighter. He’s no walk over. Super tough. Super gritty. Super headstrong, so there’s nothing that I see. He was just a guy who wasn’t busy and I wasn’t busy. We’re in the same weight division. He’s a light heavyweight. He’s a two-time world champion. He really didn’t lose the belt. He gave it up to fight for the belt to get a draw, so he’s still a champion basically. All I see is a champion, the guy who’s ready and willing to fight and so on. This is a business. Do you feel that it would be easy for you to get a fight after this debut if you were able to beat Badou because of who he has and what he’s considered in the division? I’m not overlooking him. I’ll be focused on him. I’m not worried about fighting no other champions. All I’m worried about is fighting Badou Jack on January 19. And after that, we can discuss whatever. But until then, I’m only talking about fighting Badou Jack at MGM Grand on January 19 in Las Vegas. That’s about it. Leonard, quick question here. I hope you’re having a good New Year’s. Looking at the WBA and WBC ratings, Badou and Marcus were both one and two. Is there a particular reason why you went with the WBA route for this fight in terms of the interim title? No, not necessarily. As you just mentioned, both of these guys are highly ranked across the board. It wasn’t difficult at all. And from the Badou perspective, he is always willing and ready and basically available to fight any of these guys. He has a tough fight against Marcus Browne for the WBA interim title and we’ll move on from there. Badou, if you beat Marcus Browne, would be your preference to go directly into a Bivol fight or would you like to explore another possibility? There are a lot of big names out there. Sergey Kovalev and Eleider Alvarez fight two weeks after me, so let’s see what happens. I’m focusing on what’s in front of me. But I’m willing to fight any one of the champions. I prefer the one that pays me the most. If they’ll pay me the same, probably Bivol. But like I said, Marcus Browne is first. That’s it. One more question for you, Badou. What did you think of Bivol’s last couple of performances where he went the distance with older veterans? I think he is a good fighter. I think he’s a good boxer, athletic. Everybody says, oh, he’s going to knock this guy out. Yes, but this is boxing. Jean Pascal is a tough guy. It’s not easy to knock everybody out. That’s the thing. It’s a different story when you fight veterans and tougher guys than when you fight prospect opponents that you’re supposed to knock out. It’s a different story. My last fights have been against world champions. It’s a little harder to knock guys like that out. But Bivol, I think he won every round. Most of the rounds against him anyway. I think he’s a good fighter. Marcus, should you beat Badou Jack, is it your wish to go directly to Bivol or would you like to explore other possibilities? This is prize fighting, so whoever’s got the biggest prize, that’s who I want to fight. But, yes, whatever makes the most dollars, makes the most sense to me at this point in my career. That’s where I’m at with that. But I’m not looking past Badou Jack. He’s not a guy to be overlooked in his own right. I’m not going to feel and talk about ten months ahead when I’ve got the biggest fight of my life in 17 days. Marcus, just want to get your personal opinion. Leaving you out of it, who do you think is the best light heavyweight in the world out of those four? Marcus Browne. I ain’t leaving me out of it because I don’t care who’s the best light heavyweight because you’re talking to one right now. Marcus, given how most of your fights, since 2015, the last three years, really ended pretty quickly, are you making any adjustments in having to ensure that you’re able to go a full 12 rounds against a guy like Badou Jack? That’s for me to work on and for you to see on January 19. At the end of the day, I know the type of fighter he is. We know he’s a work horse of a fighter and we’re prepared for that. He’s got great form. On January 19, you’ll see that I’m in shape or not. 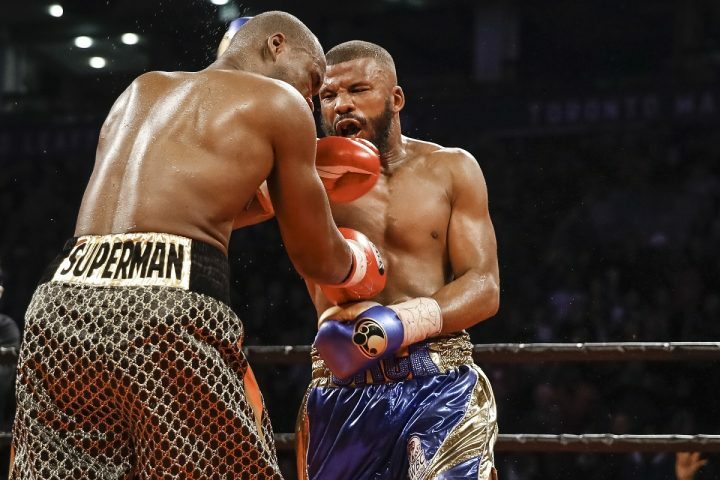 Do you still kind of feel like you need that win over Badou Jack to sort of make a true statement to all the boxing fans out there that you do belong in that elite echelon of fighters at 175 pounds? I need a win against every fighter that I step in the ring with. No fighter is going to define my legacy. At the end of the day, this is all part of God’s plan, it’s already written and I’m just following it. This is not my dream, it’s my destiny and I’m taking it one day and one step at a time, one fighter at a time. Badou Jack is not going to define my legacy and determine whether or not I am a real player in the light heavyweight division. My performance in this fight will. Badou you said you wanted to make a statement. What advantage does your experience give you with a guy like Marcus Browne with all of his skills? Also, when you say you want to make a statement, does that mean that you don’t want to leave it in the hands of the judges and that you do want to get a knockout? Of course, I don’t want to leave it in the hands of the judges. If you’re a fighter, you should never go the distance. Every fight is a different fight so you never know. But all I know is I’ve been there before. I know what it takes. I know I’ve been on a bunch of pay-per-view cards. I know what it takes in front of those lights. When it’s really getting down to a 50-50 fight, when you’re in a tough fight, I know what it takes. Do you feel like, when you say you want to make a statement, do you feel like you want to get a stoppage? What are your thoughts on that? I’m listening to my corner and following the game plan. Of course, I want to knock guys out. If they don’t come, they don’t come. I’ll show you January 19 what I’m about. Marcus, do you feel any pressure to get the knockout, win every single round and that way, make a statement and not leave it in the hands of the judges? In other words, are you concerned about winning this? I’m not concerned about anything at all. At the end of the day, we know what we’re working for. If a knockout comes, it comes. But if not, we are winning every round and that’s that. I’m not here to lose rounds and that’s about it. But I’m not concerned about what the judges are doing. We already know what type of time it is already. We should know how we’re coming. I’m not looking for a knockout. I’m just looking to box and do what I do and implement the game plan and systematically break him down. We would like to thank everyone for joining the call. We’re 17 days away. Again, this is a great, great matchup. Outstanding co-feature to Manny Pacquiao taking on Adrien Broner on January 19. I guarantee you, this fight here will be probably the best fight on the card. These guys will be looking to steal the show, and again, it’s a very outstanding matchup and we’re very excited. Thank you everyone for joining the call.